Golden Saint is a rare Willpower creature card. It is part of the Core Set. In addition to the card's availability in the Core Set, one copy is included in the Band of Survivors deck, one copy in the Imperial Might deck, and one copy in the Tribunal Glory theme deck. Golden Saints first appeared in Morrowind, and later reappeared in Shivering Isles and ESO. 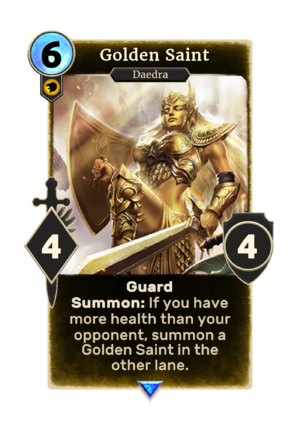 For more information on Golden Saints, see the lore article. This page was last modified on 1 January 2019, at 16:56.